Ed "NJWeedman" Forchion court verdict: Ed "NJWeedman" Forchion talks before and after the verdict is read in his Burlington County jury trial on charges of marijuana possession and possession with intent to distribute. MOUNT HOLLY — A jury convicted medical marijuana activist Ed “NJWeedman” Forchion of possession Wednesday, but could not reach a verdict on the more weighty charge of distribution. Following the verdict announcement in Superior Court in Mount Holly, an uncharacteristically agitated Forchion, dressed in a white T-shirt with a green cannabis leaf pictured inside the O of the letters LOVE, challenged an assistant Burlington County prosecutor that he would be ready for a retrial on the distribution charge. Forchion, who is representing himself, shot down his court-appointed lawyer’s plan to file a motion to have the court dismiss the possession with intent to distribute charge, saying angrily that the process would only delay the resolution of his case. The motion would have had to have been heard before a new trial could begin on the outstanding charge. Forchion, 47, grew up in the Browns Mills section of Pemberton Township but later opened a medical marijuana dispensary in California. He was arrested in April 2010 when he returned to New Jersey to visit his children and was stopped in Mount Holly with a pound of pot in his trunk. Since then, Forchion has heavily promoted his case in an effort to further argue against New Jersey’s marijuana laws. 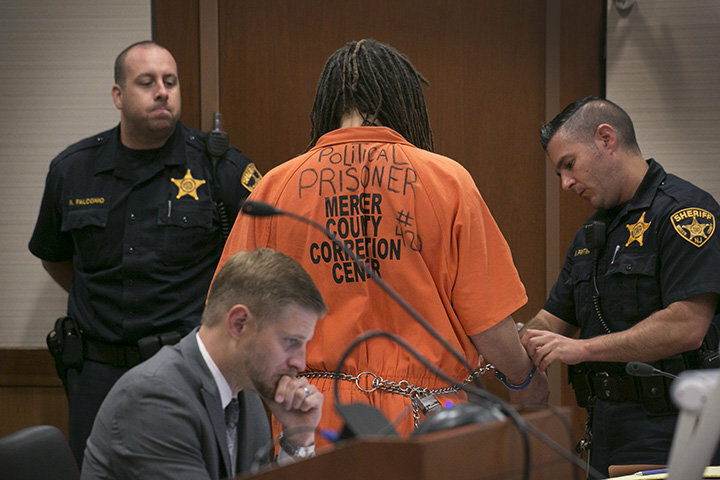 “This is bigger than me,” Forchion said while waiting for the jury’s verdict Wednesday. “I’m not in here just fighting for me. In his opening arguments last week, Forchion boldly proclaimed to the jury that the stash of pot was his but he maintained that he never had any intent to peddle his “medicine” to others. During the trial, experts from both sides presented their opinions as to whether there was evidence that Forchion was intending to distribute the pot. The NJWeedman is dead. Long live … NJRepealBailReformMan?